Our Yellow Magic 7 cleaner was formulated as a flexo UV ink and varnish cleaner for printing human and pet food packaging. For some time now, we’ve been hearing from customers who have found it works well for another application: cleaning parts on SLA 3D printers. If you’ve cleaned an SLA printer, chances are you used Isopropyl Alcohol (IPA), also called isopropanol or dimethyl carbinol. Until now, IPA has been the go-to cleaner for this application because it gets the job done. The downside is that IPA is a flammable chemical compound with a strong odor. This means you’ve got to make sure you’re wearing personal protective equipment (PPE) and storing it properly so you don’t accidentally blow yourself up. As for the smell… well there’s not much you can do there. Why use Yellow Magic 7 instead of IPA? We first heard about people using Yellow Magic 7 instead of IPA for 3D printers on a Formlabs forum, and since we began offering 1 gallon jugs of YM7 on Amazon we've seen positive reviews from customers using it for this purpose. Unlike IPA, Yellow Magic 7 is non-toxic; it’s biodegradable, low VOC and low odor. Because it’s water-based, it's not a fire hazard like 90+ IPA. Yellow Magic 7 also performs well in an ultrasonic cleaner. 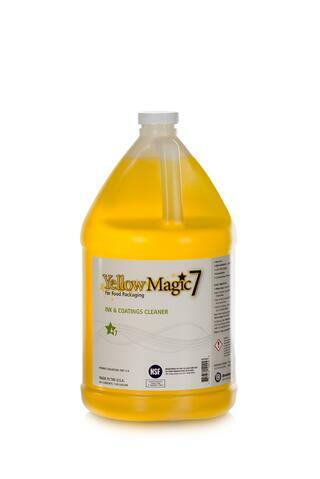 Yellow Magic 7 is versatile enough to clean a variety of printer parts and accessories, such as rubber pads and rollers, and is effective on both the acrylic tank and the PDMS layer. So, what we’re seeing so far is that you can still get the job done using Yellow Magic 7 without the stink or the potential of blowing up your co-workers or family. Which is nice. If you’ve tried Yellow Magic 7 for SLA 3D print cleaning, we want to hear from you. What worked well? What could be better? Let us know with a review on Amazon or email sales@bradley-systems.com. If you haven’t tried it, we have one-gallon jugs available through Amazon. I hope you’ll give it a try and let us know how it worked.